Custom dinnerware for the boardroom, yacht or corporate jet makes a statement...it's the look of exclusivity that gives your table distinction. Pickard offers a complete range of standard dinnerware pieces along with an assortment of specialty items such as cream soup and demitasse cups. Add your company logo to your favorite Pickard stock pattern or create a unique design. 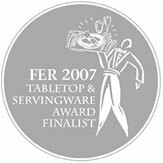 Pickard's minimum custom order of only 25 place settings or 125 pieces makes it easy to enjoy your own special china service. Pictured are some examples of the many available decorating possibilities. A narrow band of your signature hue encased in gold or platinum could adorn just the edge of a plate, or perhaps you'd like the entire rim filled with color. 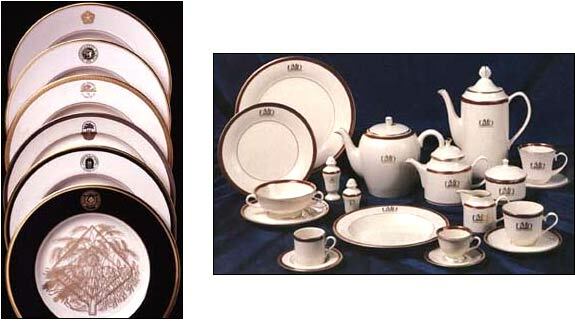 You can choose your favorites from a variety of different plate and cup shapes.